The planets spice up the night ... adding surprise and delight! Their dances with the setting and rising Sun, the phases of the Moon, the twinkling stars and each other are heavenly treats that fill our hearts with unforgettable images. Is it a planet? ... What planet? When you look up at the night sky, how do you know you are looking at a planet? Keep reading and you'll find out! Note: 2003 UB313 has officially been named Eris. The International Astronomical Union, meeting in Prague August 24, 2006, voted and agreed that a "planet" is defined as a celestial body that (a) is in orbit around the Sun, (b) has sufficient mass for its self-gravity to overcome rigid body forces so that it assumes a hydrostatic equilibrium (nearly round) shape, and (c) has cleared the neighbourhood around its orbit. Note: Pluto doesn't meet the (c) planet requirement. This means Pluto has been reclassified and we no longer have 9 planets. 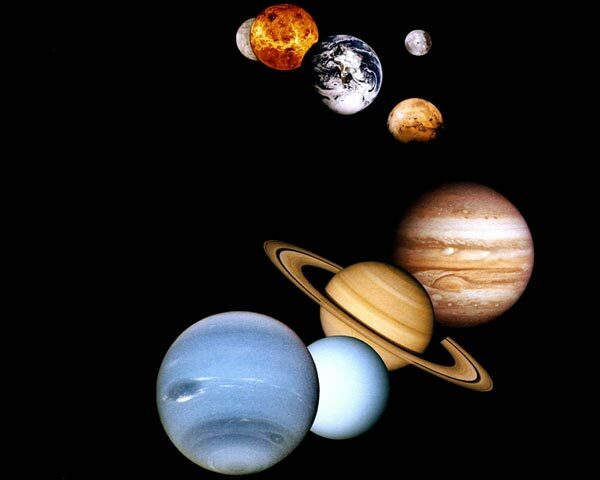 The 8 remaining planets in our solar system are Mercury, Venus, Earth, Mars, Jupiter, Saturn, Uranus and Neptune. Pluto, Ceres, and Eris (2003 UB313) are now known as “dwarf planets”. More "dwarf planets" are expected to be announced by the IAU in the coming months and years. Currently a dozen candidate "dwarf planets" are listed on IAU's "dwarf planet" watchlist, which keeps changing as new objects are found and the physics of the existing candidates becomes better known. A plutoid is a celestial body orbitting around the Sun at a greater distance than Neptune. It assumes a near-spherical shape, and has not cleared the neighbourhood around its orbit. Satellites of plutoids are not plutoids themselves. As of June 11, 2008 the two known and named plutoids are Pluto and Eris. It is expected that 42+ plutoids will be named as science progresses and new discoveries are made. How Many Planets Can You See in the Night Sky? My Violent Evil Monster Just Scared Us Nuts. 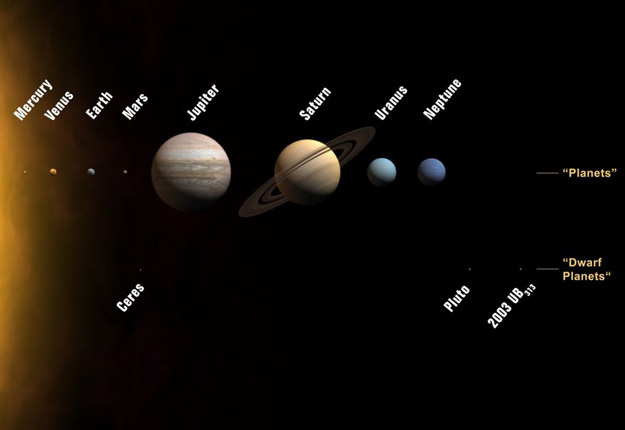 The planets follow the path of the Sun and Moon. If you watch the Sun travel across the sky during the day and the Moon during the night, you will become acquainted with their path from horizon to horizon. This path is called the ecliptic and changes only slightly with the seasons. If you find an unusually bright non-twinkling object in the night sky along this path, it is probably a planet. What Planet Are You Looking At? 1. Certain planets are not visible or rarely visible to the naked eye. 2. Some are typically seen near the horizon at sunrise or sunset. 3. Others are visible in the night sky. 4. Each planet emits different color. This planet is not visible to the naked eye. This planet is rarely visible to the naked eye however, annually, a few weeks before and after its opposition, Uranus reaches the faint visible magnitude 6.0 and can be seen by the unaided eye in a dark country sky. See Planets 2001-2030 to find the planet's dates of opposition, currently occurring in September and October. Small yellowish-white Saturn is generally seen in the night sky. Jupiter is usually found in the night sky far from the Sun. It is large and glows a brilliant white light. Reddish Mars, generally seen during the night hours, appears at its biggest and brightest about every 2 years during its opposition. See Planets 2001-2030 to find the planet's dates of opposition. Venus can be found near the horizon at sunset or sunrise. It is large, extremely brilliant, silvery in color and often mistaken for a UFO! This elusive planet is only occasionally seen low in the eastern sky before sunrise, or low in the western sky after sunset. It is often hidden in the glowing embrace of the Sun. Elusive Mercury is the only planet that twinkles, flashing a bright yellow color. *Both Mercury and Venus may appear as crescents, while the other planets will always appear full. Most observers only see the crescent shape through a telescope. Check out the helpful links on this page. Become a night sky traveler! Be blessed by the planets.